CAREER HIGHLIGHTS De Chatillon started his automotive career with PSA Group in 1989 and has held various management positions with the Peugeot and Citroen brands in different areas of the company. 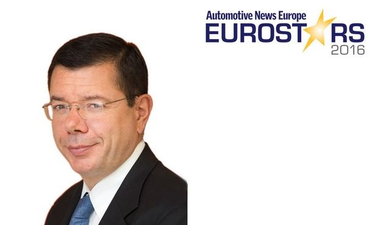 While his main emphasis during nearly 30 years with PSA has been on finance, De Chatillon was managing director of Citroen in Belgium and Luxembourg from 2001 to 2006. He was appointed PSA's group financial controller in 2007 and promoted to CFO in January 2012. REASON FOR WINNING: De Chatillon has played a key role in PSA's impressive financial turnaround. The company's automaking unit set a record for profitability in the first half with a 6.8 percent recurring operating margin. De Chatillon was the architect of the automaker's 3 billion euro capital increase in May 2014 and had been instrumental in getting the entire PSA organization to operate as frugally and effectively as possible to maximize profits and eliminate waste.